Reading: I just started re-reading Kisses from Katie: A Story of Relentless Love and Redemption after my visit to two orphanages last week. Much like Jen Hatmaker's books, I have been underlining line after line. It's so interesting for me to be reading this book again after being in Romania. Although Katie's story is very different from mine, there are so many things that I can relate to. To very, very briefly summarize, Katie traveled to Uganda in December 2006 when she was 18 years old for a few weeks, and returned in the summer of 2007. She continues to live there (she's 26 now) with her 13 adopted daughters and helps to run a nonprofit organization, Amazima Ministries, that she started in 2008. For more details about her story and Amazima, I would strongly encourage you to click HERE. "Sometimes working in a Third World country makes me feel like I am emptying the ocean with an eyedropper...I have learned to be okay with this feeling because I have learned that I will not change the world. Jesus will do that. I can, however, change the world for one person." "Through the frustrations, God taught me to laugh at myself, my ways of doing things, and what used to be important to me. He taught me that when doing my best was still not enough, that was when He took over; and because of His great grace and love, even in the frustrating moments I was filled with an inexplicable happiness and peace, my daily proof that I was living my purpose." "The contradiction comes when I realize that all these experiences and emotions were real. The happiness that gave me chill bumps was as deep as my loneliness. My sense of certainty about being exactly where God wanted me was solid, but just as firm was the fact that I wondered at times what on earth I was doing here. The frustration that threatened to overtake me on some occasions was just as deep and true as the unbounded joy I felt at other times. I loved my new life; I truly loved it. But compared to the life I have been living, it was hard...Despite the obstacles, I felt a surprising level of comfort living in Uganda most of the time. I felt I was born to be there, and in many ways, living there seemed more natural than living in my native country. I had the unexplainable feeling, a settled knowing, that I was where I was made to be. I knew deep in my soul that I was home." 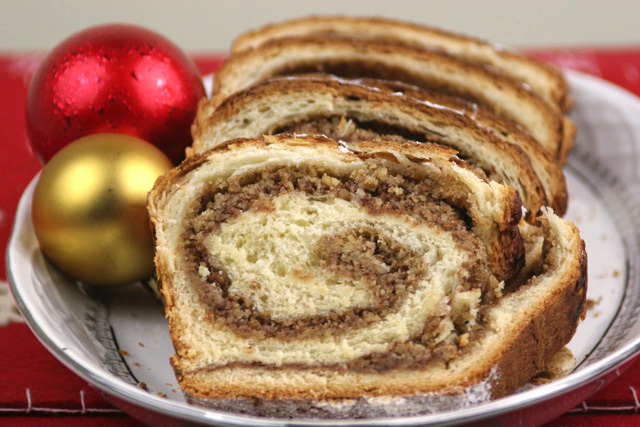 Also, I have been eating cozonac, which is a traditional Romanian sweet bread. Everyone here makes it for Christmas, as well as some other holidays. It is delicious! At the Veritas Kids' Club Christmas program, each of the families were given a loaf of cozonac and there were extras so I got to take one home! I was thinking about buying some at the store the other day, but I decided not to. I guess that was why! Anyways, I do not have a photo of cozonac so I got this one from Google...sorry! Thinking about: What is in store for the new year. I can hardly believe that it's almost January 2016! I'm not one to make these grand New Year's resolutions, but I do like the idea of a fresh start (kind of like the beginning of a school year). I am going to try to set a few small goals, but nothing major...goals like trying to cook more often, possibly learning to play the piano, and making more time for reading and art journaling. I've also been thinking about how crazy it is that I'm almost halfway through this second round of #CBtakesRomania. While on FaceTime yesterday, my mom asked if it's harder being here longer this time, and it's really not. I had a small rough patch a few weeks ago, but things are going well. I continue to feel at home here in Sighisoara. I've made some incredible friends, LOVE the kids and teens I work with, and enjoy the other miscellaneous tasks I've picked up along the way. Listening: Christmas music! Spotify has some amazing Christmas playlists! I've been stuck on Folksy Christmas, A Classic Christmas, and even Christmas Pop...for the classics like "All I Want for Christmas Is You" by Mariah and "Merry Christmas, Happy Holidays" by NSYNC. Aside from Christmas music, I've been listening to Adele's 25 pretty consistently, as well as One Direction's new album, Made in the A.M. Yes, I am still a teenage girl sometimes. Take me or leave me! Spotify also has a Discover Weekly playlist, which updates every Monday morning. This playlist is based on what I have been listening too, as well as what similar fans are listening to. It's pretty amazing. My first playlist wasn't the greatest, but it's been improving. It's a fun way to discover new music, which I always love. Watching: As always, Gilmore Girls, but also, Christmas movies! I've decided to watch one Christmas movie every day this week. So far, I've watched The Holiday, The Family Stone, and Love, Actually. I watched Elf a few weeks ago. Some others on the list include Stepmom (a depressing Christmas movie, but one of my favs! ), Home Alone, Frosty the Snowman, Rudolph, This Christmas, and a few others. We'll see what I have time for! Loving: Thinking about the future...as crazy as that may sound. I feel like God might be working on something for me, and I'm anxious and excited to see what happens with it. We shall see!